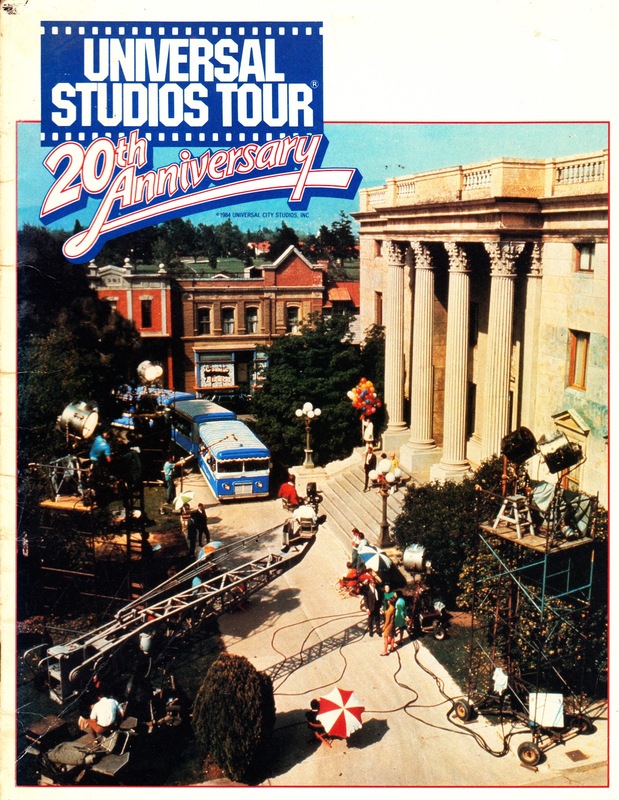 This is something I picked-up from a secondhand book store: a 1984 guide to the UNIVERSAL STUDIOS TOUR (which was celebrating its 20th anniversary that year). It was bound to catch my eye anyway but the thing that made it a must-have was the two page spread devoted to the legendary (and now - sadly - long since defunct) BATTLE FOR GALACTICA attraction on the tour. 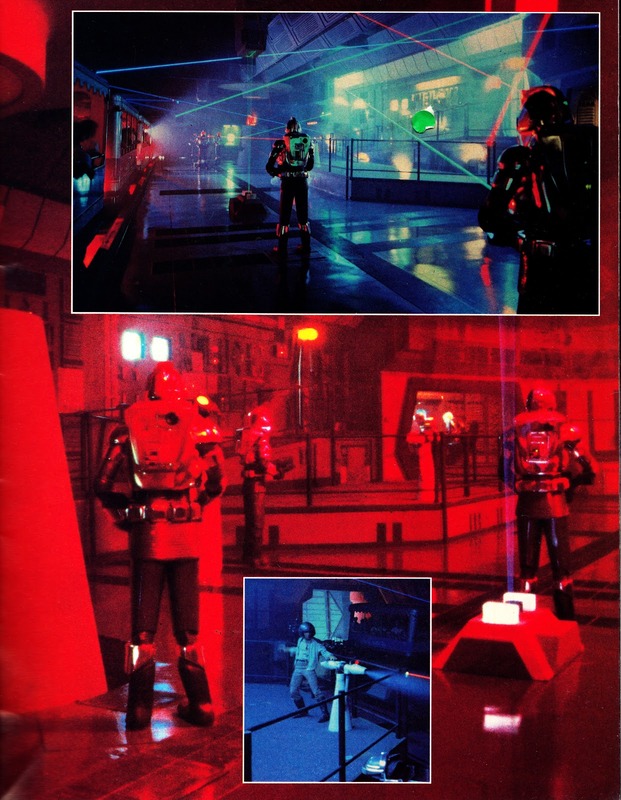 The tour segment opened in 1979 (just as the TV show was being cancelled, something that must have been a considerable frustration to Universal who clearly thought they had a cash-cow on their corporate hands) and finally shuttered (replaced by a BACK TO THE FUTURE ride) in 1992. The ride involved the tour tram (see the cover picture below) being intercepted by a large Cylon craft. 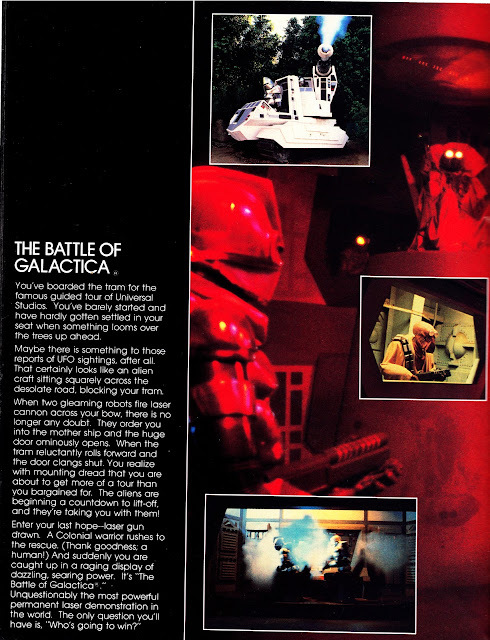 The tram is taken aboard and menaced by some animatronic Cylons (led by an decidedly off-model Imperious Leader) and Ovions (a pricy, high-profile, alien menace that the TV show - surprisingly - never resurrected for a return engagement). Just as the Cylon vessel is about to take off, a lone Colonial Warrior bursts in (in a hail of laser fire) and the tram escapes. The whole encounter only took a few minutes (the tour had a strict timetable to keep). Centurions also wandered the tour to entertain the punters. The famous Dirk Benedict improvisation from THE A-TEAM (originally from the episode Steele before it became a title sequence fixture) happened whilst filming on the backlot. The KNIGHT RIDER episode Fright Knight also makes extensive use of the backlot. It's possible to spot a decidedly past-its-prime Colonial Viper (possibly the one that was used whenever a wrecked Viper was required... or the full-sized version in a terrible condition) and the Monkey Bar from TALES OF THE GOLD MONKEY. Many (MANY!) Universal shows used the Universal lot on a regular basis and even, on occasion, cheekily used attractions on the tour as cheap sets. Famously, THE SIX MILLION DOLLAR MAN, used the ice tunnel for the two-part 1976 story The Secret of Bigfoot. I think this ride is featured in Beverley Hills Cop 3.